Its snowing like crazy where i live so i feel i can still say "Seasons Greeting" ha. I am so EXCITED over this post! I'll be reviewing: The Best of Winter 5 Pack. I love the 5 pack, its the perfect pack for winter & i have been loving giving them out also as gifts to my friends and family & everyone loves them too! I love the USA Softlips brand packaging more than the new Canada Softlips packaging! Its more elegant & pretty! I love this Best of Winter Line, they are so nice and make my lips so nice & stay moisturized so nicely! I tell people who ask what i use to keep my lips beautiful, proudly tell them this Winter line from Softlips! Thanks Softlips for making such yummy scents! This one has a very light Sugar & Spice scent, i love this one but i wish the scent was a bit stronger! It does smell like fresh baking though, which is delicious! This would be my favorite scent! It has such a amazing addictive yummy fresh berries scent! It smelled nice but a very light sugar cookie scent, not strong at all, which is nice but i would have liked to smell the sugar cookie scent more than the spf in this one. it has a fresh minty scent & makes you have that "just brushed you teeth feel"! I love this scent ALOT! It has a very Winter time smell! The Mint one and the Winter Mint one are both super nice but i think they pretty much smell the same, but the Winter Mint one is a bit stronger than the Mint one. I prefer the Winter Mint one. They all have a light spf scent you can smell & taste, which is kind of annoying, but i still love them, the names of all them are adorable. Something that would be nice is if for next years "The Best of Winter 5 Pack" is if they would add a "Organic option" because i think their organic products moisturize more and smell better. 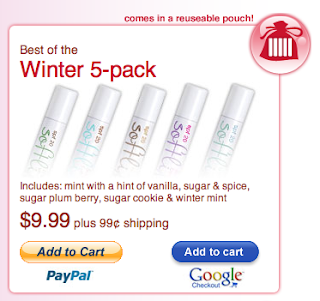 Go to their site here, to order the Best of Winter 5 Pack or other Softlips Packs! I hope they add more scents for 2011 The Best of Winter packs! I would love to see a Organics 2011 The Best of Winter packs! I have been loving giving these to my family & friends for the holidays for gifts! I cannot wait to try more products from Softlips!